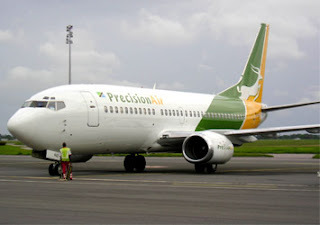 African Travel Blog: Precision Air has launched its flights to Lusaka, Zambia! Precision Air has launched its flights to Lusaka, Zambia! Precision Air has launched its flights to Lusaka, Zambia, becoming the third airline to enter the market this year after Emirates Airline and Royal Dutch KLM. The airline, which touched down at Kenneth Kaunda International Airport at 13:05 hours on Friday, was characterised by pomp and splendour as it received a water salute amid cheers from senior Government officials, ambassadors and Tanzanians living in Zambia. Minister of Transport, Communication, Works and Supply Yamfwa Mukanga, who officiated at the launch of the airline in Lusaka, said the development will enhance trade between Zambia and Tanzania as the distance has been cut to two hours from 10 hours. Despite Zambia and Tanzania being neighbours, businessmen and women travelling to Tanzania had to fly via Nairobi or Ethiopia due to lack of a direct flight. “Many businessmen especially car traders go to Tanzania and it takes them 10 hours to fly to that country hence delaying business transactions. Every business person knows that time is money and I’m happy that Precision Air helped reduce the distance to Tanzania,” he said. Mr Mukanga called on the airline to ensure that it remains on the Zambian market unlike some airlines, both local and foreign, which have closed down. “I hope Precision is not on transit but here for good. We would like to see Precision grow like Kenya and Ethiopian Airways to give customers a variety of choices,” he said. Mr Mukanga said Zambia has a history of local airlines folding but he is happy that the airline has braved the storms in the industry, adding that Government will support the growth of the airline. Earlier, Tanzanian High Commissioner to Zambia Grace Mujuma said the airline will strengthen economic ties between the two countries. At the same occasion, Precision Air chief executive officer Alfonse Kioko said Zambia becomes the 16th destination and is expected to launch flights to Lubumbashi in the Democratic Republic of Congo next week. Plans are also underway to launch flights to Lilongwe and Harare outes as well..